The Canon 5D Mark II update to the original Canon 5D had been long expected and rumored since 2006, just a year after its introduction. 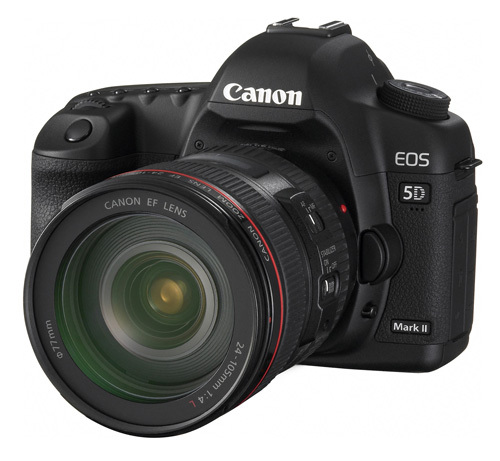 However, when Canon finally announced the 5D Mark II about 2.5 months ago, Canon still managed to shock the industry. As we mentioned in Canon Announces 21.1MP 5D Mark II, most expected a solid update to 16MP or so with performance similar the current 5D - updated to include the current sensor cleaning, a larger LCD, dynamic range expansion, and hopefully an even better ISO range. It was not until just before the announcement when some specs were leaking that everyone realized Canon would use an updated version of the 21.1MP sensor used in their $8000 1Ds Mark III, along with the latest Digic 4 processing and a 10-stop ISO range that extended from ISO 50 to ISO 25600. To both significantly extend the sensor resolution and extend the ISO range to beat the champion 12MP Nikon D3/D700 was something no one really expected. Since that announcement, we have all been wondering if the full-frame 5D Mark II was for real - and it's been a long wait. Yesterday we finally received a production Canon 5D Mark II and we have been busy since. We couldn't wait to take a closer look at ISO performance and noise, and compare the performance of the 5D2 to the 24.6MP Sony A900, which is the current resolution champ, and the Nikon D700/D3, which are the current ISO champs. While we were at it we also took a closer look at performance compared to the original Canon 5D, which developed quite a reputation the last three years for color accuracy, high resolution, and low noise. 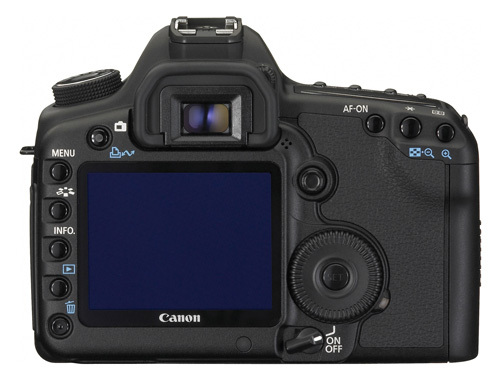 Many pages could be written on the handling and features of the Canon 5D2, and they will be written by us and others. For now, we are trying to answer the question of whether the 5D2 was worth the wait and the hype. Is performance improved in the update to the 5D? Does the incredible 10-stop ISO range compare favorably to the current Nikon D3/D700 and does the 5D2 become the new ISO champ? Did Canon find a way in the 5D Mark II to simultaneously increase resolution to an impressive 21.1MP and increase the ISO range in a manner that would do the legacy of the 5D proud? After the somewhat disappointing performance of the Canon 50D skepticism runs high. The 15.1MP 50D was expected to take the resolution crown in the APS-C market, but instead it basically tied with the 12MP D300/D90/Sony A700. This is certainly not a poor performance by any means, but it did not match Canon's marketing claims, and it brought into question Canon's claims about the performance of their new sensors. We hope in the next few pages to shed some light on the answers to these questions that are on the minds of anyone looking for a full-frame DSLR in the suddenly fully populated $3000 category. Is the Canon 5D2 everything we had hoped it would be? Yes, that's the point to it. Just make sure that when on a tripod, the lens turns the IS off. I'm in the process of moving from Canon (40D) to Nikon (D700), but I must say the new 5D doesn't look too bad at all. I was worried the higher density was going to ruin high ISO advantages. I will say - I slightly prefer the D700's noise over the 5Dmii, but really it's splitting hairs - they both look great, with usable results at 12K ISO. I've seen images of black dots on the right side of pixels with very strong highlights - I'm wondering if any of this was experienced? Oh, and Anandtech, for the love of God, get a new test shot. The side of a Nvidia box is a horrible test for any type of detail rendition, though I guess with a black color it's okay for noise. Yes, first impression is not bad, but a second says that maybe it's only in resolution that 5d2 beats d700 but d700 seems to beat 5d2 in all the rest. Have a look for example at white labels with text on them, do you see how the 5d2 creates color blotches around letters? I noticed the same on the test pics from other sources as well. Would you confide in a camera which on a black and white surface creats blotches of pink, green, blue, etc.? How this camera would behave depicting the real scenery? Undoubtedly it would add such tiny colorful blotches in any contrasting boundary, adding color which does not belong there. "Well, you know, that pic from the 5d2 has certainly more detail than those from the old 5d and d700, but the pics from the old 5d/d700 look more natural somehow, more pleasing to eye. I like them better!" Of course they look more pleasing and natural, as they do not contain those nasty tiny bloches of color in spots where they do not belong. And I don't only speak of high ISO's, the same problem is evident at any ISO, as it has to do with some flaws in the sensor of the 5d2, inadequate microlenses maybe, which act as tiny prisms creating colorful tinting in contrasting areas, or something else, I dunno. I know only that I was waiting so long for upgrading from my old 5d to the new 5d2, but now I'm starting to look at the d700 which performs impeccably in everything. You are so wrong here, you can't even imagine. Right now, the Nikon D700 is considered to be out of contention when compared to the 5D mkII. The image quality of Canon's new product so far outclasses that of the D3/700 that neither comes close. The poor image Wesley uses has been derided for years as being useless for telling us much of anything. What you need to do is to look for pictures around the net from both camera families. you will be surprised. If the other "example" you tell us you've seen, is as bad as the one here, then it's useless. While I am admittedly a Canon user, you seem to be a Nikon one, in the closet though you may be. However, while the newer Nikons did pave new road in low noise, that road has been paralleled by the 5D mkII. There may be slight differences in the way the noise is presented, as all companies use slightly different techniques, but they are about equal. As I said I've got a 5d1 with quite a few Canon lenses, and I'm going to use in in future too, but at the same time I'm planning to buy a modern camera which would permit me to go into higher ISOs and, possibly, into higher resolution provided it is not achieved with a loss of other quality points. I haven't taken a final decision yet, and I continue to study all relevant pics that appear on the net. I only hope that it could be explained in some other way than I did, e.g. that it might be some sort of CA which definite lenses produce on a sensor with 20+ resolution, or something like that. Did you take the photos used in the DPR forum post, or find them elsewhere? Without knowing what has been done to those images, the comparison is relatively worthless. That looks like regular old color noise, at something like a 5000% zoom. Without knowing what ISO this was shot at and what was done in post processing we can't tell much else about it though. I'm not quite sure what the first link is supposed to show, what with all the images there. But I'd like to know more about the second. A small amount of chrominance noise removal would eliminate that. ACR uses 25% chrominance as normal for noise reduction, with 0% luminance. I've found that doesn't detract from the sharpness at that level of setting. Nikon is known to use a fairly high noise removal on its files, whereas Canon, on it's semi pro and up models, uses little. That is very likely the difference you see there. However you do it, the 5D mkII will have much greater detail at the same print size, and the ability to go larger, or to crop. This also allows one to use stronger noise removal, which is needed for every camera to some extent, without losing as much detail. At the same print sizes, the Canon will have less apparent noise because of the smaller pixels in the print.